This is usually what is provided either by the hello-world-sample or the skeleton created by your IDE and typically looks the like in this in image. In this case, the VBox being inserted into the Scene and all controls within that VBox (the actual content) are said to be the scenegraph. JavaFX applications can contain additional stages as the following depiction indicates. A Stage is an implementation of Window with the alternative implementation being PopupWindow, which is used for context menus or tooltips. On a side node, this also clarifies why you can put regular controls into a tooltip. This creates a stage with default look. There actually is a restriction here, though. Always actually means always, as long as called from JavaFX Application Thread. That thread is the default thread when not manually creating new threads. I am going to cover the details of the JavaFX Application Thread in a future article. When creating a new stage, an already existing stage can become the parent of the new stage. This especially means there is no new taskbar entry and owned stages are automatically closed when its parent is closed. The owner must be set before the stage.show() and cannot be changed afterwards, which is why the method is not named like a typical setter. If you want the newly created stage to look and behave differently you can adjust the StageStyle and the Modality. The StageStyle provides platform specific decorations of the new window, for instance removing the minimize and maximize buttons and just displaying a close button (StageStyle.UTILITY). Just go ahead and try how this changes the look of your window on your platform. Again, these flag have to be set before the stage is made visible with show(). Beginning with Java 8u40 Oracle provides a separate API for displaying dialogs. I am going to cover them in a future article. They both work the same and it is up to you decide which you prefer. 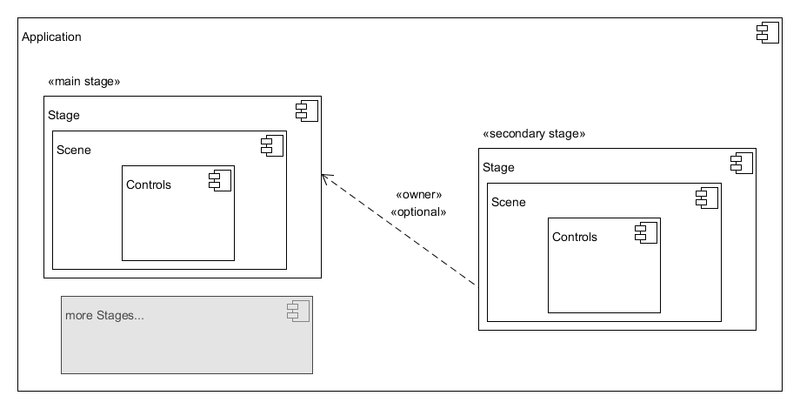 You get the Window (which is the normally is the stage) of an arbitrary control with getScene().getWindow(), which then can be closed with hide(). A JavaFX application by default exits when all stages of the application are closed. This behaviour can be turned off with javafx.application.Platform.setImplicitExit(false);, which means that the JavaFX application continues to run even after all stages are closed. Additionally any JavaFX application can be shutdown with javafx.application.Platform.exit(). This enables the regular shutdown of your application. On the contrary System.exit() prevents the JavaFX runtime shutdown and therefore should be avoided. When creating a JavaFX application you need a subclass of Application, the runtime will provide your primary Stage and you have to create a Scene and insert your content there. The upcoming article will be about the Scene Builder, which is an alternative to programmatically inserting the content into your scene.